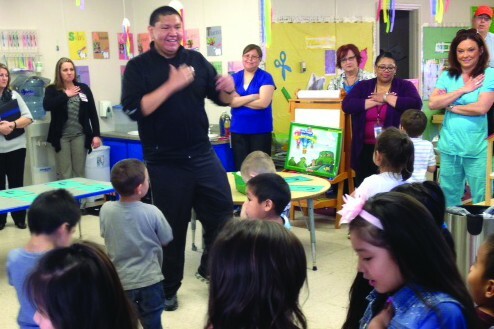 Indian Health Service’s (IHS) Clinton Service Unit (CSU) in Western Oklahoma has made a significant impact in reducing rates of childhood obesity in the local tribal Head Start setting. Through the Healthy Heart Program (HHP), CSU works with three rural and urban tribal Head Start facilities to implement a program focusing on healthy eating, physical activity, and instilling the importance of healthy lifestyles in American Indian (AI) and Alaska Native (AN) youth and families. In one school year, the HHP reduced rates of childhood obesity. Over half (55.2%) of the children were classified as overweight or obese at the start of the program (32.4% in the obese category). At the end, the number was down to 39.1%, with only 23.8% of students remaining in the obese category. At the beginning of each school year, children are brought to a tribal community center for a comprehensive physical examination. Each child is screened by IHS Medical, Audiology, Dental, Optometry and Public Health Nursing. The team works with the HHP, consisting of a Public Health Nurse (PHN), Registered Dietitian (RD) and Recreation Specialists. For the nutrition component of the HHP, a Registered Dietitian (RD) reviews the breakfast and lunch menu to ensure meals are low in saturated fats, trans fats, cholesterol, sodium and added sugars. Meals include whole grains, fruits, vegetables, low-fat 1% milk, and lean meats and proteins. The RD conducts individual nutrition assessment on each child. If a child is deemed to be overweight or obese, a meeting is scheduled with the RD and the child’s parents to discuss eating habits, dietary needs and develop a healthy lifestyle plan with the family. The RD conducts nutrition lessons two times a week using demonstrations, games and stories. The intervention focuses on encouraging students to develop healthy eating habits and is centered on the concept of “Go Food vs Slow Food”. The activities are designed to get the children to replace unhealthy foods with fruits and vegetables. The recreation specialists visit each of the three Head Start centers three times per week to conduct a physical activity session. The activities include: basic aerobic exercises, running games, nature walks, traditional Native American dance, basic stretching techniques and principals of Tae Kwon Do (physical contact is not initiated). The PHN conducts a lesson on the heart to show the relationship between nutrition, physical activity and the effects of healthy habits on the body. The lesson focuses on the location, structure and size of the heart in terms applicable for a preschooler. Students are taught to locate their pulse and to feel their heart beat. To reinforce the message of activities carried out to the children, a monthly “Healthy Heart” newsletter is sent home for the parents. The newsletter discusses HHP activities in the classroom, nutrition and physical fitness tips, and kid-friendly recipe ideas. Hawaii’s modern culture has taken a toll on young children, especially Pacific islanders who have higher obesity rates than the nationwide average. Farm to Keiki focuses on building life-long healthy eating habits by connecting children with nature and fresh foods. The Physical Activity Kit for Young Children (PAK) — Staying on the Active Path in Native Communities is a vast resource for child care providers and parents. It contains culturally appropriate physical activities and movements for infants, toddlers and preschool children.